Are you going to fillet a Salmon tonight? If yes, then you must need a perfect fillet knife that is designed especially for Salmon. Salmon is large as compared to the other fish; it needs a large knife with long blade. A knife with a long blade and sharper edge is perfect to fillet a Salmon. Most of the times 7 inches to 9 inches blade knives are good for Salmon, but you must make sure that your knife is sharpened. If your knife is dull or it has rust, then you can ruin meat of your salmon due to exertion of extra force. 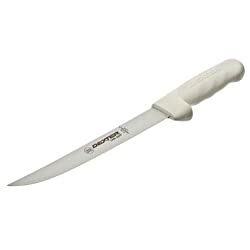 A recommended knife for Salmon is Dexter-Russell 8 Inches Fillet Knife. Dexter-Russell is an old company that is providing people with kinds of knives since 1818. The fillet knives are included in their diverse variety of knives. Their fillet knife is usually long and slim with a very flexible blade. As compared to the commonly used fillet knives, fillet knives by this company have a more flexible and longer blade that is sharp enough to move through the bones and meat of the fish. These knives also provide a perfect grip. Blade of this fillet knife is made from High-Carbon Steel. Blade is very tough and hard with a perfect edge that can do filleting without need of extra force. This blade is 8 inches long and can easily move through bones and meat of salmon. The edge of this knife is kept extra sharp to make the filleting or cutting easier. The tip of the blade is given a point shape that makes it easier for knife to get through the bones and meat. This knife provides user with comfort while filleting a Salmon. Handle of this knife is made up of synthetic plastic that are very strong and durable. These handles are not broken easily, even if you unfortunately drop your knife. The handle is grip textured that makes it a way comfortable to handle this knife. A perfect grip is felt when you have this knife in your hand. Size of handle is normal that means it will fit perfectly in your hands. It is very necessary to keep the knives clean. If you do not keep your knives clean, these will become dull in a very short period. It is advised to dry and lubricate your knife with oil after washing it in lukewarm soapy water. These Knives have a sealed handle around the blade that makes it easier to clean them. Blade is also made such that no stains are left on it. If you do not dry your knife after washing it, it can get rust very quickly. A knife with rust is of no use. While washing, make sure you do not touch edge of knife, as it is sharp enough to give you an injury. There are many other knives available for filleting a salmon, but this fillet knife is highly recommended due to its unique features.